15 of the Best (and Most Offbeat) Attractions in Iowa! Whether you are just driving through or making a weekend out of it, the state of Iowa has plenty of unusual attractions for you to check out. Whether it’s the film site for the iconic “Field of Dreams” movie, or a matchstick-made marvel, the list is long as it is surprising for unusual attractions in Iowa. To begin checking out some of these spectacles, here are 15 unusual attractions in Iowa. Located amongst the cornfields of rural Iowa, the Grotto of Redemption is the largest man-made grotto in existence and is widely considered the “Eighth Wonder of the Word.” Comprised of nine separate grottos, each section is dedicated to a different depiction of the life of Jesus Christ. While the sheer enormity of this religious-themed wonder is awe-inspiring enough, the history behind the dedicated pastor, Father Paul Matthias Dobberstein, who built this man-made marvel, will inspire something great in you at this unusual Iowa attraction. According to the Star Trek legend, the celebrated Captain James T. Kirk, will be born in Riverside, Iowa, in the year 2228, and the present residents have already begun celebrating his arrival. With a quick visit to Riverside, you can visit the commemorative marker that designates the town as the future birthplace of Captain Kirk, check out the Star Trek Voyage Home Museum and if you come at the right time in the summer, take part in Trek Fest, celebrating everything that has to do with the celebrated series. When Marion Mitchell Morrison was born in Winterset, no one in the small community could have imagined what this man, who would later be best known as John Wayne, or perhaps The Duke, would go on to do in the world of American movies and history. With your current day visit to the historic birthplace of Hollywood’s most iconic actors, visitors can see the restored 1907 house in which Morrison was born into, as well as a 6,100-square-foot adjacent museum dedicated to the life and career of the Duke himself. Ride the rails down to Britt for one of the only Hobo Museums in the country featuring art, exhibits and a showcase of the lifestyle of itinerant workers and railroad riders. Not only does Britt have the Hobo Museum, outfitted in the town’s old cinema, but every year the small town hosts the Hobo Convention, which acts as a rallying place for the community to gather and crown the new Hobo King and Queen. Snake Alley in Burlington is a cobblestone street that slithers its way up a grassy hill, creating one of the most crooked streets in the country. Originally constructed to link the downtown and shopping districts of Burlington across the steep Heritage Hill, Snake Alley has taken on a life of its own as a unique attraction in this riverside town that is worth a visit alone. Is this heaven? No, it’s Iowa. Dyersville, Iowa, to be exact. Located a short drive from Dubuque, the official movie site of the iconic “Field of Dreams” motion picture still sits patiently amongst the cornfields. With a visit to the movie site, one can learn more about the film and location, see the set where the Academy Award nominee movie took place and if you visit at the right time, you might even see some players emerge from the cornfields to play a part in America’s favorite past time. Described as one of the shortest, steepest scenic railways in the nation, the Fenelon Place Elevator takes passengers 296 feet along its rails to the top of Fenelon Place, a scenic outcropping where you can view the entire town of Dubuque and the bordering Mississippi River. A fun ride up for sure, it’s really the view from the top that makes this unusual attraction worth visiting. Though as simple as it sounds, the Tree in the Road in the small town of Brayton is quite the sight to see. Sprouting proudly from the center of a four-way gravel road intersection, a Cottonwood Tree prominently greets the not-to-common passing vehicle. The perfect place to snap a photograph, or perhaps just see something new, this unusual attraction can be found few places else. See the exact spot in history where the infamous plane carrying Buddy Holly, Ritchie Valens and JP “the Big Bopper” Richardson crashed into the cornfields. A somber reminder of a grim time in history, the memorial also commemorates the lives and artistic expression lost on that fateful day. While you are visiting Clear Lake, you can also check out the Surf Ballroom, which is the location of the last set these musicians ever played. For a more macabre unusual attraction, the Villisca Ax Murder House in Villisca was once the sight of a gruesome mass-murder that defined Iowa history. Nowadays you can visit this still haunted location and feel for yourself the evil that resides either in a day tour or private overnight stay. For an outdoor unusual attraction in Iowa, the Spook Cave in McGregor consists of an underwater cave tour taken place atop a boat. Let the guides navigate you around this fascinating cave, pointing out the many different geological features that make up the cavern, and after the ride, be sure to check out the surrounding campgrounds that complete your journey to the Spook Cave. Grant Wood was not only born in the state of Iowa, but many of his native landscapes have provided the inspiration for some of his greatest works. 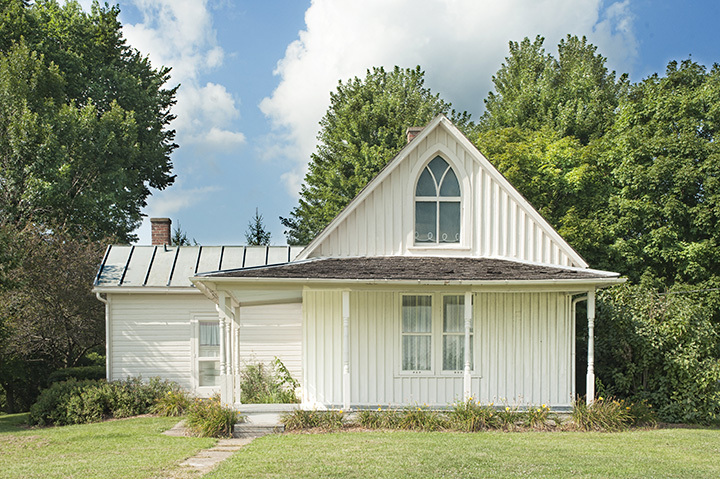 Perhaps most notably in his collection, the backdrop and inspiration for his 1930 American Gothic painting can be found in Eldon, including with it an opportune photography moment for you and your friends. Open seven days of the week, April through November, Matchstick Marvels has on display some of the most intricate replicas of modern structures in the nation, all completely made of individual matchsticks. Iowa artist Patrick Acton has dedicated much of his life to creating matchstick models of famous structures such as battleship USS Iowa, the International Space Station and Hogwarts School of Witchcraft and Wizardry, all of which are on full display for you to see. Serving as one of the last three “Squirrel Cage” jails in the nation, this once-revolutionary jail design didn’t last long in history, and Council Bluffs is one of the few remaining places you can still see this architectural attraction preserved through the ages. A key factor of the Squirrel Cage design is a way to isolate prisoners, making the Squirrel Cage Jail Museum a great place to visit, not a fun place to stay overnight though. Financed by various agricultural industries across the nation, Albert the Bull stands proudly in Audubon to commemorate the thriving beef industry in the region. Touted as the world’s biggest bull, standing at 30 foot-tall with a 15-foot horn span, you can see this mega attraction from miles away. Whether you spot it from afar, or you stop to take your picture, Albert the Bull in Audubon is always happy to see you.